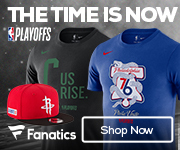 I cannot believe that Mother’s Day is just a week away, and whether your sports minded Mom is classic or on trend, Fanatics has you covered. I have long been a fan of giving something different and thoughtful on this day. When I first started thinking of my own Mom, who is classic and loves a good handbag, my first thought was to check out the Dooney and Bourke collection. I mean, who doesn’t love this line? Mix in your favorite team, and you are totally set. I am a huge Steelers fan, just like my entire family, and this is the perfect bag for my Mom and Aunt. Yep, and then there are those on trend Mom’s, like my sister and most of my best-friends. Right now I am loving layered necklaces, and what is not fun about mixing in your favorite team’s nameplate. I love this Lakers piece, as it is very on trend for Los Angeles, and simply mixed with a few others, it is fun and hip at the same time. Make sure you head over to Fanatics for all of your favorite Mom’s out there, and year around, for all kinds of amazing gifts for everyone! Anyone else as excited as me, that the NBA playoffs are here? One of the things that I love about this time of year, is that there is so much fun fan gear, and it can be worn in so many different ways. I came across this Golden State Warriors Jacket available at Fanatics and was instantly in love! They have several teams in this cool snap front vintage style from Starter. The back of this jacket is just as cool as the front, and to be honest, if I were going to any music festival I would go sporty and wear this. There is something about a simple denim short and tee to make it more stylish and fun. Not to mention braids are so back in style, and if you want to be super on point, throw some in and take this look up a notch. We all know that I am going to pair my looks with some cool kicks, and these Jordan’s are my favorite right now. The cool zip makes them even cooler, and they also come in black!